Cor-Pak EX VpCI Sheeting is made using high-density polyethylene and extruding with Vapor phase Corrosion Inhibitors (VpCI) to protect ferrous and most non-ferrous metals from corrosion. Perforated on rolls, the sheets are convenient to use. Simply wrap the item to be protected with the Cor-Pak EX sheet. 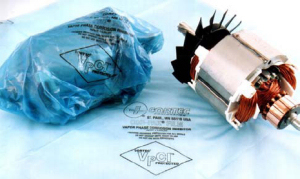 The VpCI in the sheet volatizes and migrates with air then condenses on all metal surfaces, reaching all exposed areas. The sheeting provides a high level of corrosion inhibitor protection along with excellent moisture barrier properties. It is unaffected by most solvents, strong acids and alkalies. The sheets are transparent to allow visual inspection of the items within. It's flexible and strong making it easy to wrap items including oddly shaped parts. Lightweight. Recyclable. Protected parts can be used immediately without the need for degreasing or cleaning.